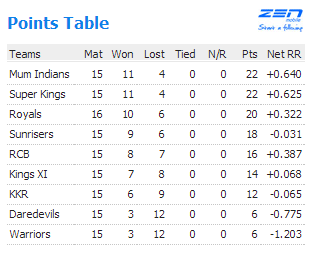 A very important game for Sunrisers to keep them in the hunt of Playoff’s position. Cameron white won the toss and decided to Bat first, and he would have thought a dreadful start even in dreams as SRH lost Dhawan, Parthiv & Cameron White for just 5 on the board. Vihari along with Samantray steadied a bit, before going for a skier. Sammy joined Samantray and scored very important 56 runs between them, Late strike from Perara made sure Sunrisers scored 136/9 in 20 overs. Bowling star was Faulkner who picked up his second 5 wickets haul against Sunrisers for the second time for this season. Chasing 130+ was never easy in the Hyderabad pitch and it proved to be again. Dravid had a good opening but apart from him everyone else struggled in the pitch. No one from Rajasthan got going, last minute rush from Kevon Cooper made sure Royals didn’t lose it big. 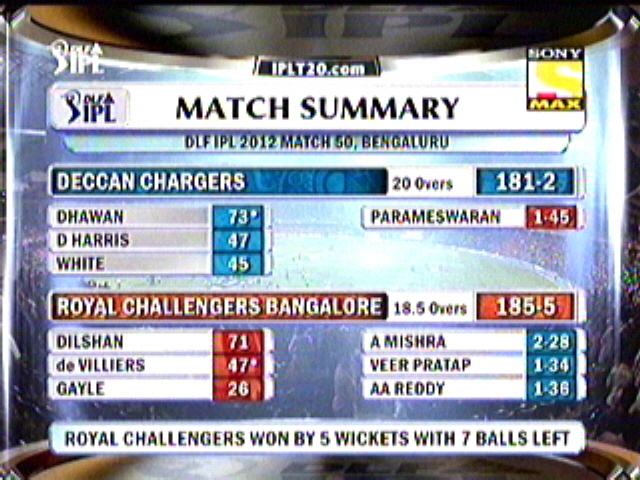 In end Royals were strangled at 113/9 in 20 overs. A Spell of 4-0-8-2 from Amit Mishra which proved too much for Royals in the end. 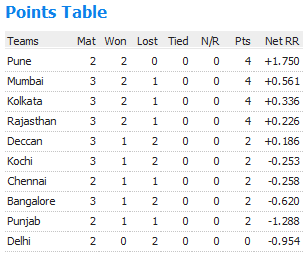 This win means RCB have to win their game tomorrow against CSK to stay in the tournament, if they lose its curtains. With this win Sunrisers also knocked mathematical chance of KXIP for qualifying. – James Faulkner became the first bowler to pick two 5 wickets haul in the same season of IPL history. – Amit Mishra is the 6th Batsmen to be out for a diamond duck. – Both the five fers of James Faulkner has come against Sunrisers Hyderabad. – Biplab Samantray scored his Maiden fifty in IPL career. – Sunriser’s Fifty of 67 balls equalled the slowest for this season along with Pune. – Rahul Dravid became the 13th player to score more than 400 runs for this season. – James Faulkner’s 5/16 is the best bowling figures for this season bettering his previous best 5/20 against the same opposition Sunrisers. 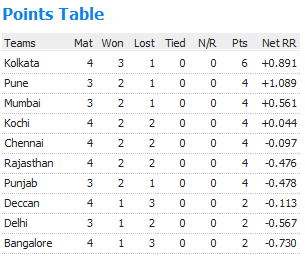 – 113/9 is the lowest score by Rajasthan have scored for this season. Previous was 117 Vs RCB. – Stuart Binny is finally dismissed after 8 games on a trot remaining not out. – A six to start off for Dravid is the seventh in his IPL career, where he has hit a six inside power play overs. – Rajasthan became the first team to finish off all their 16 games for this season. 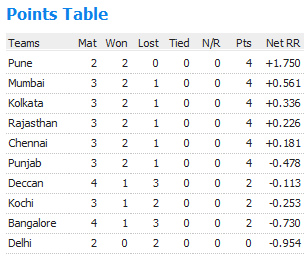 With Points table in an hustle, Chennai needed to win this to keep themselves safe and ahead of others. Same the case for Mumbai as well. Bhajji won the toss and decided to bowl first in Wankade Stadium, Mumbai. Chennai got off to a poor running as Du plessis went as a dead duck to a poor call from Murali Vijay’s call, how veer he made it with some good hitting after that. Raina, Bravo & Dhoni joined the party to make a good score, Malinga’s bowling in death was accurate as ever, where Mumbai conceded only 13 runs in last 12 balls bowled. Mumbai started off with a maiden by Franklin, once he departed, Sachin joined Rohit Sharma and displayed once of the classy knock you could watch all day long, one word to describe was they were cruising to victory like a space ship. When Tendulkar was caught by brilliance of Faf, Mumbai needed 40 runs of 25 balls, Easy u would say with 8 wickets in hand, But CSK kept their nerves to pick up bunch of wickets from then, as Mumbai need 16 runs in last over. Ben Hilfenhaus bowled the first three balls beautifully for just 2 runs & a wicket, but next three balls was absolute blenders as he fed the hungry Dwanye smith with full tosses and he ate CSK and burped for 6,4,4 to win the game for Mumbai. 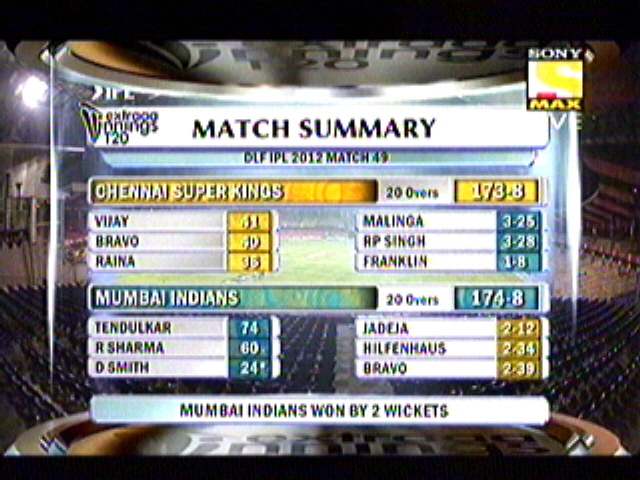 Mumbai Indians won the game by 2 wicket in the last ball. Deccan already in the party spoilers list nothing much to think about, RCB has to win this one without doubt, if not they will fall behind in the end of this season. Vettori dropped himself for Murali to come in, Kohli capped the RCB team and won the toss and decided to field first. RCB again started of well, Dilshan being the aggressor and Gayle was rotating strike around him, When Gayle was about to explode, DC go this wicket, very soon they picked up Kohli with a stunning catch from Dale Styen. 78 runs from 36 balls, it was almost game for DC, until one man from South africa decided against it, AB de Villers smacked all around the park, esp the 18th over by Dale Steyn went for 23 runs which really turned match on its head. To say in the end RCB won the game more than comfortable with 7 balls to spare. One & Only AB de Villers could have done that as he smacked 47 runs from 17 balls. – Murali Vijay went past 1000 runs in IPL career. – This is third time both Du Plessis & Murali Vjay has been involved in the run outs. – Ben Hilfenhaus & Dale Steyn bowled the 18th & 19th Maidens of this season respectively. – Maiden bowled by Ben Hilfehaus is also the second occasion in which first over given as Maiden by James Franklin, first was by Praveen Kumar of KXIP. – Sachin Tendulkar scored the first half century for this season. – Chris Gayle scored the 100th Six in IPL Career. – Rohit Sharma scored the 500th IPL six of this season. – Both the Maiden over Bowlers Steyn & Hilfehaus bowled the important 18th & 20th overs and conceded 23 & 16 runs respectively. – 2 wickets victory by Mumbai is the victory by lowest remaining wickets by any team in this season of IPL. – Lasith took over the purple cap from Morne morkel with 20 wickets to his name. – 126 runs between Sachin & Rohit Sharma is the best 2nd wicket partnership of this season, bettering 121 by Owasis Shah & Rahane. – Game 49 is the 5th game of this season to be finished in the last ball, Both Mumbai & Chennai have featured twice & RCB once. Purple Cap – L.Malinga (20) followed by Morne Morkel (19). 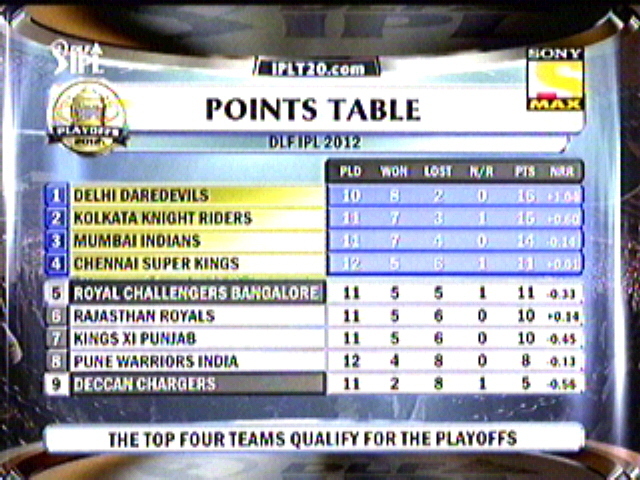 Still its not the season Delhi looking for, they end up losing another game and this time its against Deccan’s. Boneless Batting, Spineless Bowling and worthless fielding nothing gonna get Delhi pass the winning line. Hope Shewag or may de god almighty inspire them to get back in their winning ways. 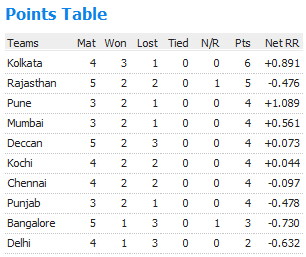 Another game, Rain plays spoil sport and RCB who’s languishing in the both of the table, just nudge up by picking up the shared point with Rajasthan, who sky up to 2nd position. – David Warner scored his 4th IPL fifty. – Sunny Sohal scored his Maiden fifty of this season and as well its his first after coming from Kings XI Punjab. – In the match between DD Vs DC, It had batsmen to be dismissed for a duck 25th time in this season and its Aaron Finch. – First Match of this season is called off, without being a ball being bowled. No.of Catches Dropped for the day – 3. Its all south indian for the night as Kochi took on Chennai and came out in the winning colours in ease, takes to bludgeoning knock from McCullum. – RP Singh Picked the first of this season and its Mike Hussey to start the proceedings. – Parthiv Patel scored the 500th boundary of this season of IPL 4. – Suresh Raina scored the 12th IPL fifty. – Its exactly the same day Brendon McCullum scored 158* for KKR in the opening game of IPL season 1 in 2008. – Kochi wins their first match in their home ground. – Second time in a row Jadeja and Brad Hodge stayed not out to win the game, previous one was with Mumbai Indians. Chennai back to winning ways after losing their lost match to KXIP, thanks to Mr.Cricket for coming back to form and deservingly taking Chennai home safely in their home ground. Yet another Midas touch from Paul Valhathy demolished Deccan’s, a astonishing all round effort from Paul got KXIP to coast with dead ease. – 136 runs scored between Gilly and Valhathy for the opening wicket, is the highest ever for the KXIP for the first wicket and for this season of IPL 4. – Paul Valhalthy becomes the first player in IPL to pick 4 wickets and score 50 runs in a match. – 8 sixes scored by KXIP in today’s match is the highest so far in this season in an innings. – Virat Kohli scored the 400th Boundary of IPL 4. 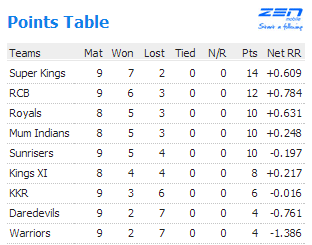 – Out of 15 matches played in IPL so far, 11 have been won in Chasing, isn’t that tell u something. – Amit Mishra becomes the 24th man to be dismissed in Duck. Another Double header day… Two back to back high intensity games, KKR and KTK finally taking the honours for winning the battle. – Gambhir scored his 9th IPL fifty and first of this season. – Till This game Rajasthan haven’t lost match after scoring 145 and above, this is the first time. – Gambhir & Kallis partnership 152 runs is the highest for any wicket in IPL history so far. – Kallis’s score of 80 runs against Royals, is the highest by any KKR player so far. – Sachin Tendulkar Scored his Maiden IPL Century in IPL. – Ambathi Rayudu hit the 100th Six of IPL 4. 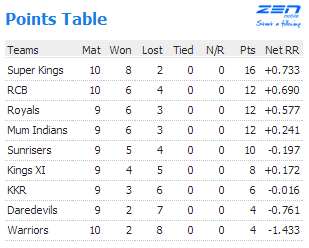 – KTK won their first game of IPL chasing, on the two occasions before they batted first and ended in the losing side. – Another day, Team Batting second won the game comprehensively. – Just 9 wickets fell for the day in all the four innings which is the lowest for a double games day.